What are your earliest memories that are related to art, and how did you start becoming an artist yourself? I distinctly remember looking through a chain link fence when I was a kid and struggling with my perception of it; my brain couldn't figure out whether I was looking at the fence or what was behind it, and my whole field of vision broke up into these abstract patterns that I couldn't make sense of. So my first artistic experience was about expanding perception, but also related to landscape since I was outside. My mother was an opera singer, and I grew up in a house where we were urged to be all kinds of creative all the time. Everything was extremely unstructured, and I was always doing something creative, playing with things or making things. I went to an awful parochial school outside of Philadelphia where there were 100 children in my classes and art was not on the curriculum. But at some point, I think I was in 5th grade, one of the nuns taught an oil painting class after school and I signed up for it. I was painting with oils and I still use the things that I learned then in the convent basement, like the craft of it and the technical skill set. I learned how to wash brushes, you know, things like that. We also had an assignment in school to make a copy of a photograph in our picture study book that we used for art history, which we got to study for like one hour a week. I did the assignment and I looked at it and I noticed it looked a lot like the painting. It was the first time I realized that I had some kind of natural skill. After that, I got sent to a private school, so instead of 100 kids all of a sudden there were only 23 kids in my class and you could be an art major and take an art class every day of the week. I really engaged with it. I entered some art competitions and I would get prizes. I was surprised, because I didn't feel especially different from everybody else. I went to college and I tried not to be an art major. I tried to study art history and aesthetics but I just kept ending up in the art classes and that was that. I was quite fortunate to have been at the University of Pennsylvania where there were great landscape painters teaching there. I didn't know that beforehand, it was just dumb luck. I've had a lot of dumb luck in my life. My undergraduate painting teacher was Rackstraw Downes. He's a MacArthur Fellow now and very well thought of as a pretty eccentric representational painter. 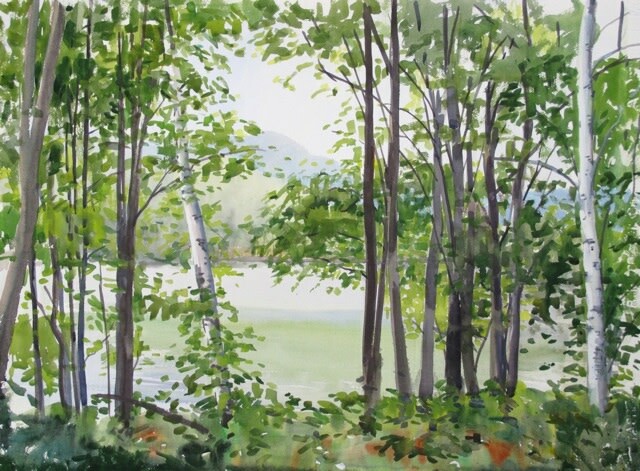 And I studied with Neil Welliver, who's a landscape painter. It wasn't like art school where you learned good technique. It was more, like, inspirational. After I got out of school I sort of resented the fact that I didn't learn anything technical from them, but I did learn something about process and that we all basically teach ourselves. My life has never been very linear, so after school I went through a few twists and turns. At first, I became a medical illustrator, and then I was hired as a college professor teaching illustration, but then they had me teaching everything in the curriculum like drawing and painting classes. I learned how to paint from having to teach it, and I ended up teaching for a long time. As soon as Kathy started selling enough paintings of mine, I quit teaching. I feel fortunate that I didn't get stuck teaching. It can become a real barrier. It's tremendously distracting because there's all these people who need something from you, and a lot of bureaucracy and politics. You're comfortable, neither struggling or living extravagantly, so you're not particularly inspired. I know a lot of people lose their motivation for painting if they're teaching. I certainly struggled with it, going back and forth between my passion and trying to stay practical. My grandfather was an artist. He was from a tiny hill town in Italy and was a Prisoner of War in the Italian army in Austria for four years. They had a school of architecture and design in the POW camp. He had a fourth grade education but he was smart and talented and hardworking. And he was an officer, a lieutenant. So he ended up going to art school. I have his diploma, which he hand painted in 1917. My grandparents were always tremendous supporters and always encouraged anything we wanted to do, but we would be at dinner and he'd always say, "Oh you think you're going to get people to pay you to make drawings?" He made his money in the restaurant business, not in the art world. He was just a little skeptical. He would still sign my tuition checks and things like that, but he always made it clear that I should try to be as practical as possible. And I did. I became a medical illustrator instead of finishing up an MFA like everybody else did. I quit after one year in graduate school and went to do pre-med and did medical illustration training so I could illustrate anatomy books. Oh, it's fascinating! Are you kidding? It's incredible. It's really interesting, because the human body and disease processes are so complex. Making drawings for scientists is fun. They're straight and they're smart and they're not manipulative, most of them. Plastic surgeons are a little weird. But it's a fine part of humanity to work with. I just couldn't stand being in an office every day. And I always loved landscape painting. Teaching gave me that chance to paint. I just got lucky. So you were always a landscape painter? Or were you dabbling in other things before you found your way there? Actually, I have a BFA in Sculpture, and my sculpture was very abstract. I've also done some ceramics. 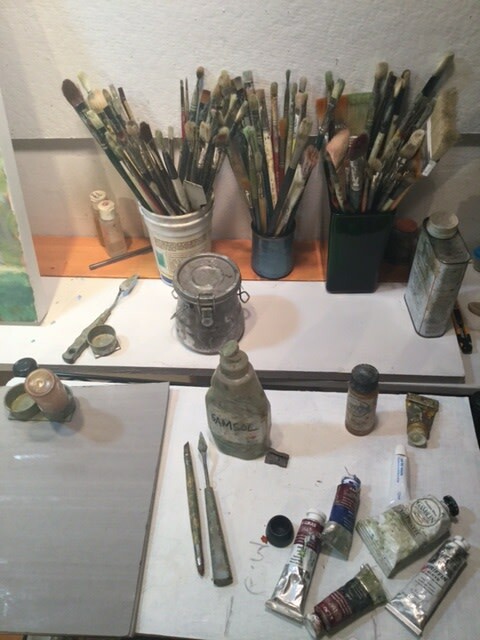 But while I was a sculpture major, Rackstraw came up to me and said, "You have to paint. You draw too well. Come into my painting class." How could you say no? So that was really valuable and a big endorsement that stayed with me. Then once I started painting it was the hardest thing that I could imagine doing, and it still is. It's really, really difficult. If it was too easy I wouldn't bother with it. I love the challenge of it, and the challenge of expressing something. I'm very wedded to real images, to the natural world and to creating images that evoke my feelings about living, or about being in the world. I like responding to it, and finding a compositional structure that somehow reflects my feelings about what I'm seeing. I always find it difficult to talk about my work because I don't have a political agenda. Writers sometimes look at my work and say, "Yes you do have a political agenda. You're painting our vanishing landscape, you're painting what we're trashing." People seem to respond to what they're projecting into the image. I really think that making art is a conversation, it's a two way thing. I have something I say and bring to the piece, and then the people who are looking at the paintings are 50% of the job. They're bringing their own stuff to it and I don't know what that's going to be. One of my paintings was placed in the Federal Reserve, in a conference room. It was this very soft and smokey kind of Appalachian landscape with muted colors. I got an email out of the blue from an economist who said, "I have to tell you how much pleasure I've gotten out of looking at your painting every Thursday morning when we meet in this conference room. I can't tell you the number of times it's brought down the temperature of the discussion if people were getting angry or upset." Or there's a painting that's in a cancer treatment center, and I got an email saying, "I just lost my husband last year, and for two years we'd go in once a week for chemo therapy and there was your painting and it really helped me and kept me grounded." For her, I found an old slide of the painting and I got somebody to make a print of it and I sent it to her. Those kinds of things mean a lot to me, and always make me feel good. That makes painting for me. I don't have to take gobs of paint and smear it on the canvas expressing my feelings about my rage. You know, you can go to therapy for that. I feel like I'm kind of subversive in a way, with what I do. I like being quiet. I like being the quiet person in the back of the room. That's okay. You were saying painting's a challenge for you. How do you push through that and keep going with a project, or with painting at all? I had a period of time when I didn't paint for five years. I think I could've sailed away. But then at some point things started lining up. 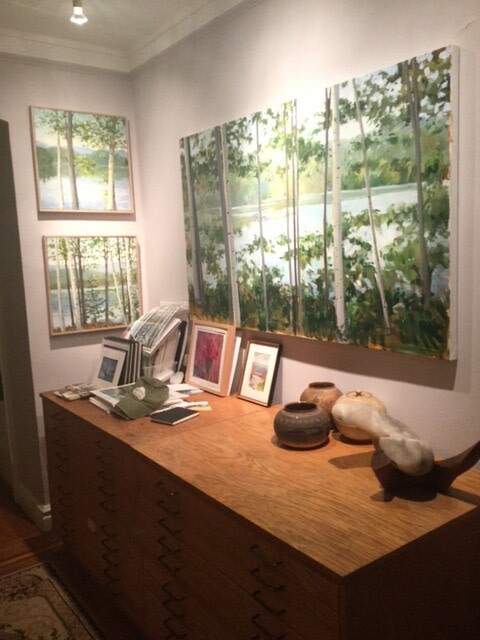 Studio space was just sort of presented to me, a little gallery in Philadelphia was interested in my beach watercolors, the botanical garden wanted me to do something with pastels, and I thought, "Okay, the stars are lining up for me to move in this direction. This is the path I should be taking." But you know this is all magical thinking, it's all projection. It was something I really wanted to do so I found all these things that told me that I could. Sometimes you need that outside push. I've taught a lot and so I see that from the other side. Now, I have students in their 70s who are already incredibly talented and have MFAs, and the reason they're working with me is because I keep them cheered up and moving forward. The thing is you can't let the bastards get you down. You just have to keep doing and making. I do thousands of sketches. I paint every day. You see that little white house painting? I painted that yesterday. I go out with this group called The Urban Sketchers, and we were at the Edgar Allen Poe house over in the Bronx. I sat down on the lawn with a bunch of other artists. There was maybe one other artist there who's a professional and everybody else were amateurs in the best sense of the word - they were just doing it because they love it. I had a blast! The pressure was off, and I made a couple of nice little paintings. Then afterward we went to a bar for a little show and tell and someone wanted to know how I could see the composition I ended up doing. I wasn't sure how to put it into words. You know, I could sit down and look at the grain in the wood floor and come up with a painting out of it, which sort of goes back to looking through the fence. It's all in our imaginations. But there isn't any secret sauce, it's just giving yourself permission to do it, and then doing it. Just keep your eye and hand moving. When it comes time to sit down and work on a studio piece, something formal that I really want to be something, this way I know I'm ready. All those sketches, it's like going to the art gym. I'm working out so that when I go to paint I'm physically fit enough to do it. Is it possible to put into words what captures you about a specific landscape and a specific scene? Do you find yourself attracted to the same kinds of things? Or is it very spontaneous, whatever's catching your eye at that moment? Both. I have two different practices. For my sketching practice, the challenge is to make something out of anything. It helps coming from an illustration background for that. When I was a medical illustrator, the work had to do a specific job and tell a certain story. Then when I taught illustration for two decades, I was teaching people how to make drawings that served a narrative, and part of that discipline is being able to walk in and draw anything. I'll also take lots of photos of my surroundings when I'm sketching. It's like I'm collecting a library of impressions, so that I can pull them out and use them another time. For big important paintings, I go back to the same places over and over and over again. 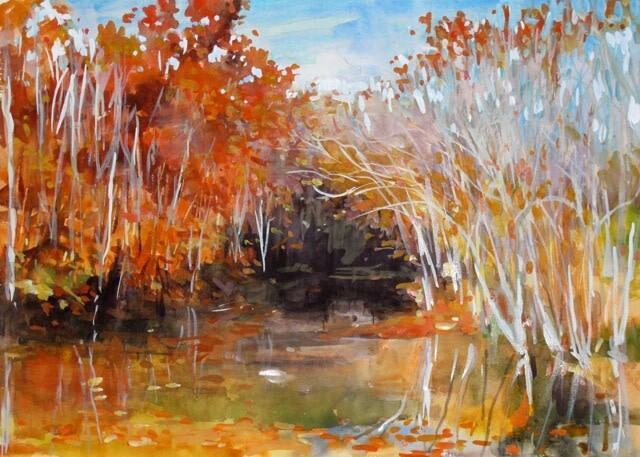 I have many paintings of these birches at a lake, and I go back there every summer. I've been there in the fall. I've been there in the winter. The lake is pretty large and I've done sketches from all different angles of it, but I keep going back to that particular scene with the birches. 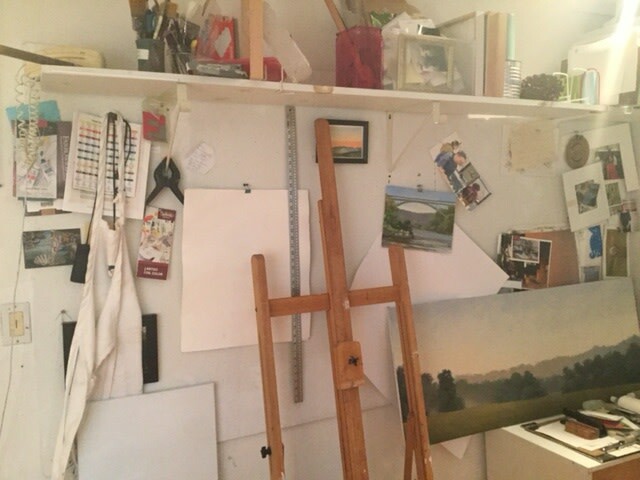 I have like ten years of paintings there. 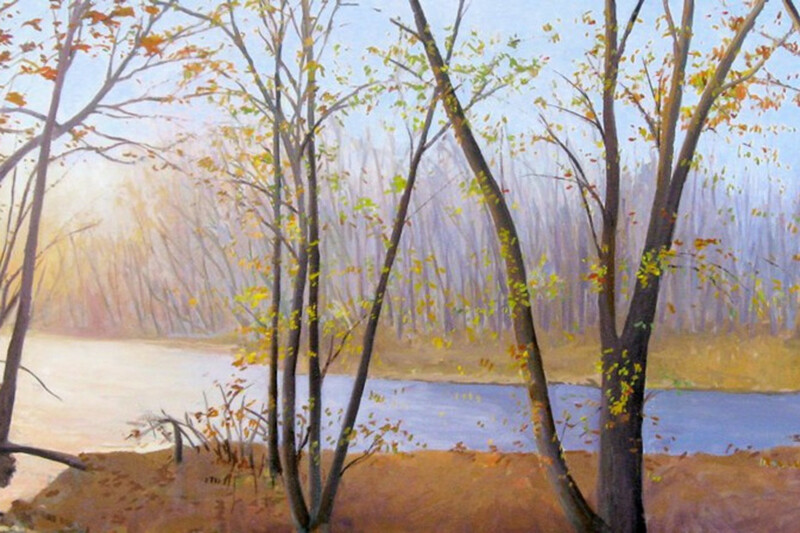 I was just in Wilmington, DE doing some plein air painting, and I've been there before. I found myself sitting in the same spot looking at the same thing, but feeling it differently. The painting becomes not just what I'm seeing then but also about my memory of it, and the memories of feelings from being there, so it's like an accumulation. I often do use photos as references when I'm back in my studio, but they're always an aid to my memory or feeling. If someone were to say, "Here's a photo, can you make a painting of it?" I'd say well, no, I haven't been there. I need that connection to it. 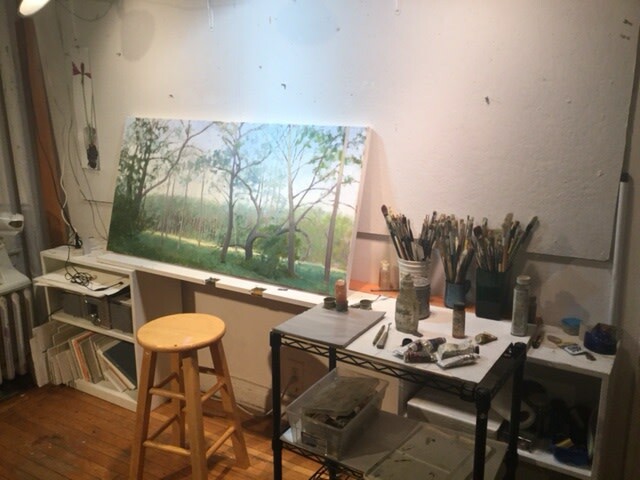 How do you balance living in the city with being a landscape painter? Look out the window! It's not bad! Before I lived in this apartment I lived in a crummy ground floor apartment on the other side of the building and I couldn't stand it. Maybe if I leaned way over at a very particular angle looking out one window I could kind of see some sky. I would go up to the Western Catskills every summer to this area that had these great rolling landscapes - mountains and clear air and lots of blue light. I reveled being there and I would take a lot of photos and I'd come back here and I'd paint that. They were all escapist paintings. I wanted it to eternally be July 15th and the hay to be high and the sun to be bright and there to be big clouds overhead, always summertime and the living is easy. I made the paintings as big as I possibly could because I wanted to fill my world with that. So they were escapes for me from the city. I grew up in the country running around wild in the woods, so I'm always trying to recreate that feeling. 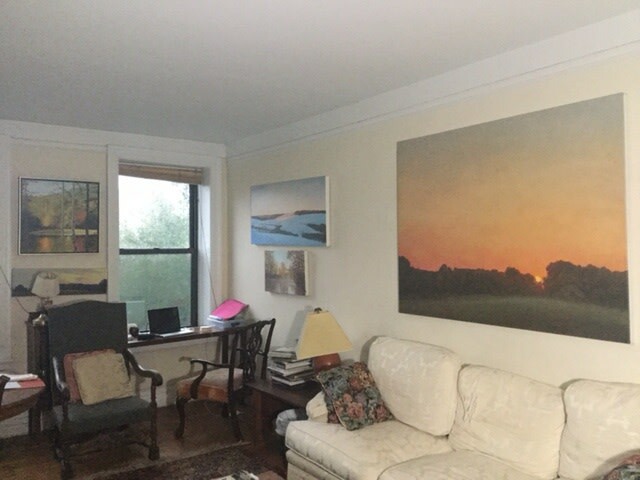 But now, I can look out these windows and see the 350 acres right across the street here, which connects with Fort Tryon Park and the Cloisters. I can see the river. I'm really perched here on the edge of the city. I love being able to visit the country whenever I want, but I'm restless and I wouldn't want to live in the country all the time because I feel too isolated. I like the fact that I can go around the corner and get a cappuccino and a croissant in the morning if I really want it. I love going to the museums and prowling the galleries to see what's on the walls. New York is so entertaining. I was in Philadelphia last week and I thought, well, Philadelphia's nice and all, but it's not New York. If I'm going to be in a city, I want to be close to the A train. It's the city, but there are still plenty of places to do plein air painting, which is what I love. I can walk across the street to the park. 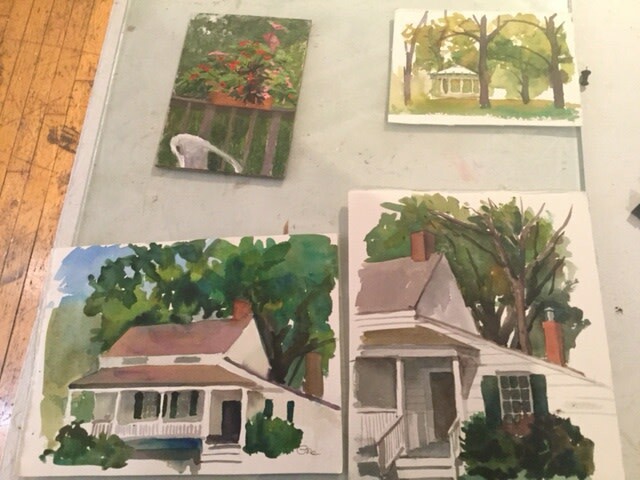 I teach these little watercolor classes in different parks or at the botanical gardens. I'll take my watercolors with me and I'll go to happy hour at the bar on the corner and sit at the end of the bar and make sketches of the bartender and the scene. They don't mind, and I have a fine time, and I don't even have to talk to anybody, and I get to have a glass of chardonnay for only $5. For all of these things, I'm not very pretentious. If people find value in what I'm making, I'm thrilled. Explore more of Elissa Gore's work here. Dear Elissa, you make me wish for more wall space and more dollar Store! GRATITUDES for the gifts you can't help that make the world more beautiful! Happy Holly and Holy days! I have worked with Elissa for many years. Have always admired her work, and now I feel I know something of what is behind her skill. Bravo. I have known Elissa for many years and this is what she is really like. Bravo to you for your paintings and your fine descriptions of what it's like -- or what it can be like -- to be a painter. Awesome. She's fun, her work is wonderful...and she sings too!! I admire you greatly, Elissa. Your work is beautiful. You have developed your lifestyle, your genius, your creativity, your passions and your skills with commitment. I loved reading your interview. This is a lovely reflection on an artist's journey. Beautiful work. I believe that Elissa is in a special class of ONE. I am not expert but do not need to be one to detect genius. From a distance, I observe her work on Facebook only but look forward to her sharing.